In my last blog I set out seven rules for marketing start ups. This time, I am going to get more specific. To get quality traffic to your website, you will need to think about your online sales funnel, as well as using growth hacking tactics. Marketing and online sales are now based on a pull model where people interact with your brand while researching a purchase, as opposed to pushing out a message like traditional media. With this in mind, you need to hold peoples' attention long enough to convert them into a lead or sale. Good marketing starts conversations. These conversations lead to brand awareness and website visitors. But, it does not stop here. You need to track prospects through to conversions. This is why savvy business now track conversions as well as uniques and page views. Visualizing (see diagram below) this process as a funnel will allow you to understand the process of attracting and retaining visitors. It is the future of online marketing, so get involved! Only 3 percent of first time visitors are ready to purchase; this means that traffic will not automatically convert into users. 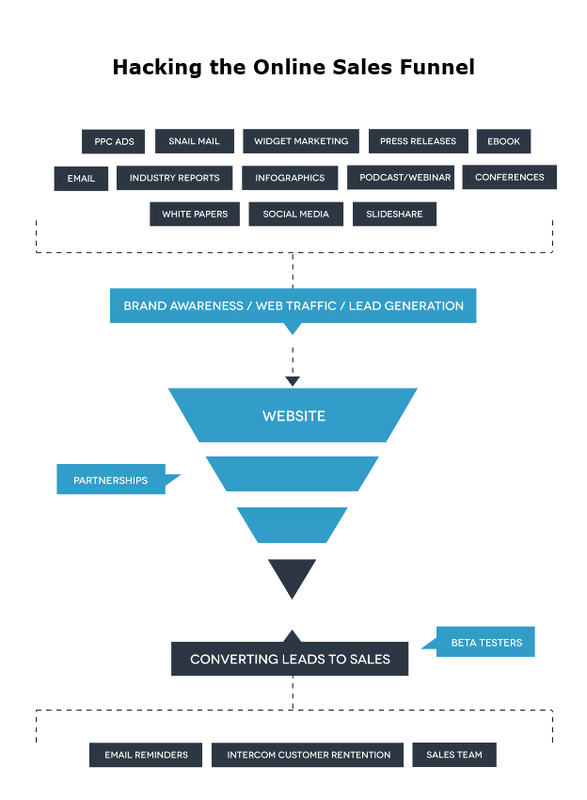 A well-constructed funnel will show you what path a user typically takes to convert to a sale on your website. Often, you can see where there are large drop-off rates, and you can quickly identify blockages. As you build your funnel, you have already started this process when you started digital marketing -- or, when you were trying to get traffic to your website. The key thing here is to monitor and understand what is working in your digital marketing mix. The easiest and cheapest way to do this is using Google Analytics, which is free, or a product like mixpanel. The start of the funnel is when you are gaining exposure for your product and people are discovering it. The Top of Your Funnel, or TOFU. As you may have guessed, this has nothing to do with curdled milk! This is website visitors who have been attracted to your website. You should create a landing, or lead capture page, which offers something compelling, like good free content (or like a useful and relevant ebook). In exchange for this, potential customers will leave their email address, and possibly other details. This should give you credibility, and make your prospects trust you. By constantly changing your offering here, you can be funneling new leads into your business at all stages. The Middle of the Funnel, or MOFU. I won't go into huge detail about the sections of the funnel, as each funnel is unique to what you are doing or selling. At a basic level, you are now nurturing leads and encouraging the people who have signed up for something to take the leap and purchase something, or become a user/take a free trial. The Bottom of the Funnel, or BOFU. This part of the funnel is the sale being closed. In the BOFU, the lead knows your brand and what you are selling. By now, you are into offering demos and free trials with the specific aim of converting the lead into a customer. Through this entire process, you are looking to spot where people are dropping out in the process. Set key performance indicators to measure this, such as goal completion, and remember it is an iterative process. You want to make changes and experiment where it is required. If this has inspired a love of funnels, there are much more detailed blogs. Dave McClure invented Pirate metrics AARRR! These 5 key metrics -- acquisition, activation, retention, referral, revenue -- are a great frame work point to keep in mind to as your funnel or funnels get more complex. It is one of the simplest models around, and as Dave rightly says, the more simple it is the more likely you are to use it. 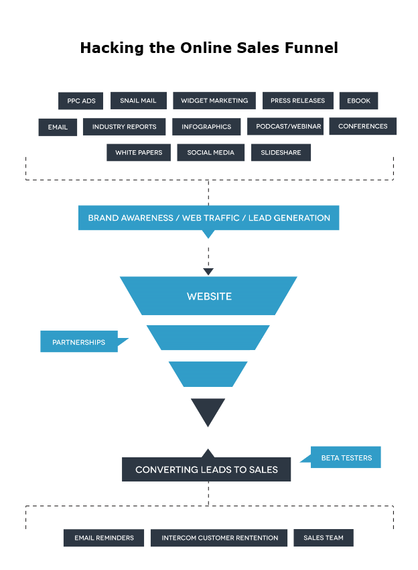 Funnels are fundamentally about two things, getting the right mix of website traffic, and widening the funnel to get as many people to the bottom (conversion) as possible. The process of widening and moving more people down the funnel is really important. So it becomes less about getting more traffic, and more about converting the existing visitors. Some great tools for this are: Crazy Egg, Snap Engage, Optimizely.